When I began belly dancing, I was living in the country (Rappahannock County) when I first started belly dancing, and had to travel a long way to study. 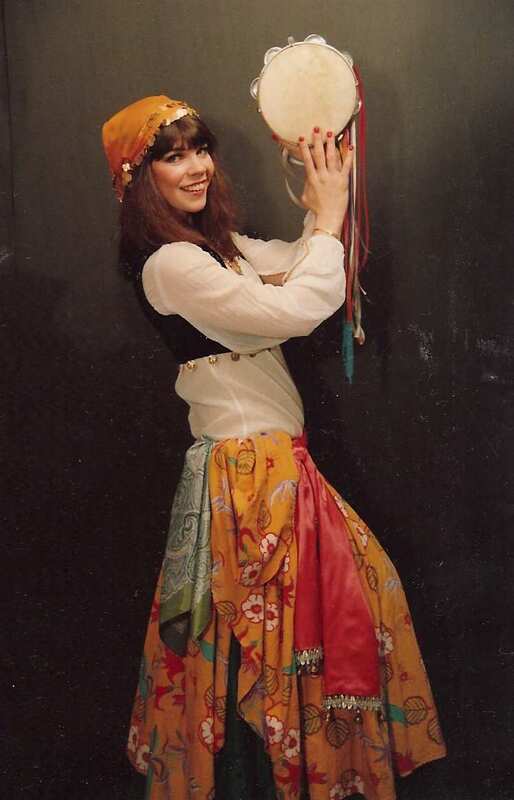 I found belly dance teachers in the DC and Northern Virginia area, and began studying with Bedia in 1985. She taught me how to perform, and then I started doing belly grams and dancing at Middle Eastern supper clubs. I joined the the Topkapi Dancers Folkloric Troupe in 1987 and began learning about folkloric dancing and how to perform with a group. My gratitude goes out to all the wonderful dancers I've learned from over the years. Criglersville, VA 1988; dancing with the Culpeper VA group under the direction of Zahra (Maggie). I studied with Maggie for a year while also taking private lessons with Bedia in Vienna VA.
Rappahannock Co. performance of an Interpretive Dance: Tribal Shamaness (to "Naked Rain" by Bill Abernathey; costume and makeup by Linda Heimstra). I performed a Zar ritual for the Harmonic Convergence Celebration in Rappahannock County (Iris Stewart used this photo in her book, Sacred Woman, Sacred Dance); photo by Rob Parker. Below: photo shoot of Topkapi in 18th Ghawazee Costume, and in assorted folkloric costumes; my Tambourine Dance costume. I was working at the Casablanca Restaurant (Alexandria VA) in 1989 with the oudist Shawkat Sayyad. We also worked together at El Cid, along with dancers Adena and Athanasia; so he suggested using "Kawakib" for my Arabic dance name, rather than "Anthea". Kawakib was also the name of a famous dancer in the 1960's (it means "planets" in Arabic). 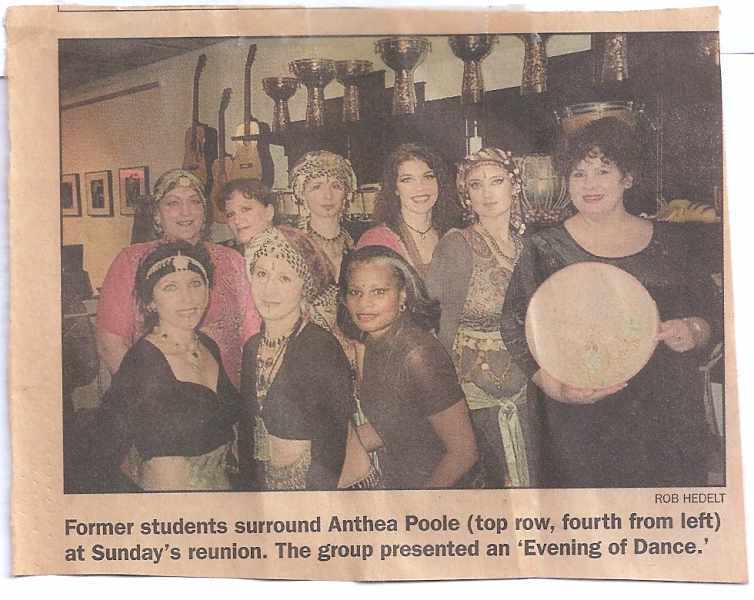 When my friend Iesha and I began belly dancing in Fredericksburg, we used the name Diva Dancers. This photo is from 1998, joining us are my Stafford County students Oriana, and Ya Meena (later of Mortifera). Above is the flyer for my first Fredericksburg show (January 2000), and a photo from the Free Lance Star newspaper. This show featured some of my local and Charlottesville students; and several out of town dancers as well. We had a small but very polite audience. A reporter came and reviewed the show, but didn't really know what to make of it. However, he DID say it was "...a pivotal moment in the artistic evolution of our hometown", so at least there's that! One of the ladies in the audience joined my classes and has been dancing with me ever since - Galiyah! 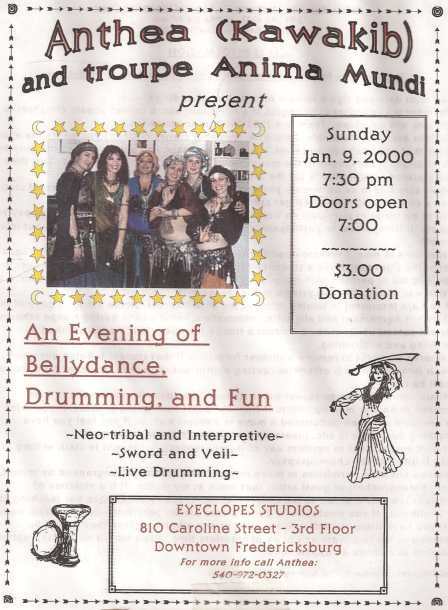 Read more Fredericksburg Belly Dance History. I discovered the Society for Creative Anachronism (commonly called the SCA) in 1992; and enjoyed researching historical Middle Eastern cultures and camping at SCA events. My Scadian name is Atesh, and at Pennsic I usually camp in Orluk Oasis. There is a large community of Middle Eastern personas now in the SCA. The yellow veil photo is from 1988; the green veil photo is from 1999. My first love was the cabaret or nightclub style of belly dance, but I also enjoy tribal improvisation, and of course folkloric styles.